Rocks, their grainy surfaces and mysterious interiors, whose existence spans far beyond the imaginable for us perishable, quickly decomposing things, have posed an inspiration for many artists. Caspar David Friedrich has made rocks the quintessence of his northern German landscapes. He has made them a rock in the sea or a towering cliff. In his paintings, the rocks are shelter and alien objects at the same time. They are always paired with human presence. People sit or stand on them, amidst phantasmal dreamscapes – deceiving places that never existed physically, that make no pretenses as to their artificiality. Rocks carry the figures, while their gaze moves into the distant depths of space ahead, seeking realms of fantasy. Sometimes smooth, sometimes coarse, Friedrich’s stony bastions of yearning are drenched with melancholy tears for they represent a lookout onto something unattainable. For Friedrich, rocks are places of dreams, plateaus from which to contemplate spheres of the mind. In his paintings, the rocks seem removed from the space around them. Their presence reminds us of the physicality of his landscapes, while the far distances and places surrounding these rocky surfaces don’t. The rocks are harbors of reality amidst oceans of fantasy. Like in a daze, the figures, in physical union with the rocks, contemplate the inside of their minds, the distant shores and remote skies surrounding them in Friedrich’s paintings. The rocks are solid strongholds of imagination. They are stages for a miraculous spectacle unfolding before them. Eadweard Muybridge, however, clads his rocks in hazy mist, dissolving their solidity into the clouds above them. This early photographer, like Friedrich, bestowed his rocks with an aura of sentiments and life. Muybridge makes their bizarre formations, their otherworldly physique and eternal age part of the human gaze, of sensation. 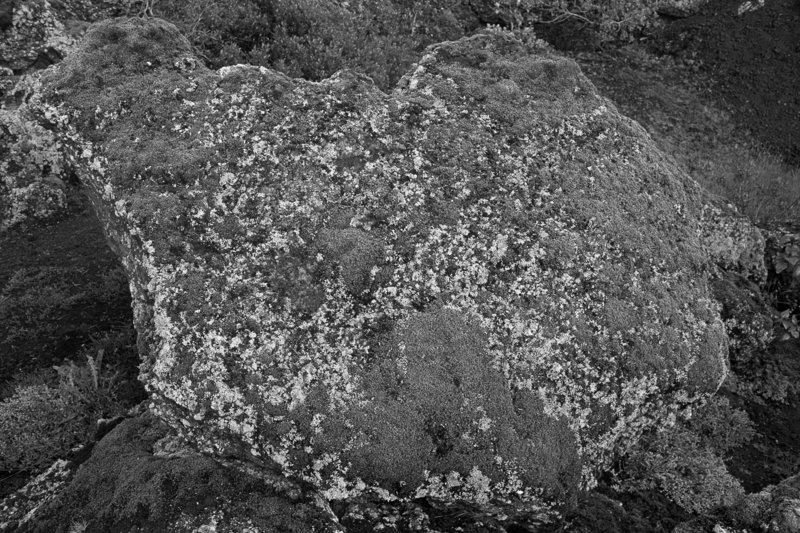 For him, the camera becomes a means for subjectively altering the rock’s existence. Muybridge ignores the distinction of sea and sky, unifying what was formerly separate. The same is true for the rocks in his photographs. Their solid forms seem to move into the distance. An immoveable thing of immeasurable weight floats in the air. What is beyond these rocks? It seems as if the world’s edge lies behind them, as if they are part of infinity. 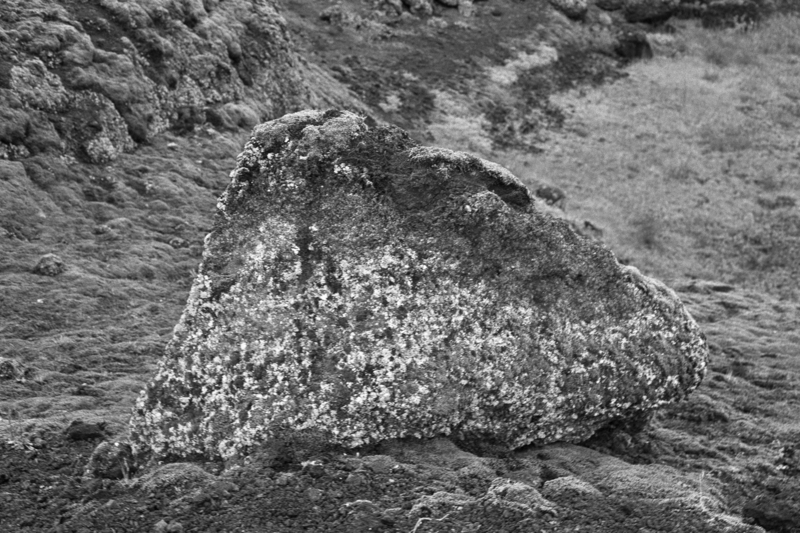 The rocks’ interaction with the mechanical device of the camera and their juxtaposition with figures reminds us that rocks, representatives of the natural world, are part of artistic experience. When Derrida spoke of the ‘stoniness of the stone’ he alluded to the inert qualities of a rock and our experience with it. He verbalises the quest for meaning within these inanimate mineral entities through brush and lens. But what is the answer to this question, what is this stoniness and how do we visualise it? A rock is a patient thing. It is satisfied with any locale, feels no need for motion. A rock’s life cycle counts in eons, years are irrelevant. We look at rocks and they seem removed from the linearity of our time. We feel as if for rocks there is no yesterday, no today, and no tomorrow. In an existence that is exaggeratedly gradual, concepts of a linear progression lack significance. Decay is not immediate, as with us who age by day. Rocks exist where nothing else survives. Rocks inhabit deserts, the deep seas, the moon, and far away planets. Dark and light cease to matter, cold and heat mean no difference. It seems only our touch makes the rock remember its surroundings. Its existence only garners immediacy through our interaction with it. How do we, as animate subjects, relate to inanimate objects like rocks? Can we overcome our suspicion towards a thing that is the opposite of us, that inhabits realms to which we have no access, that is solid while we are soft? Rocks remind us that experience is mediated by prior experience. Merleau-Ponty writes that each experience is a singular phenomenon which is defined by and restricted to the very moment it is made. This immediacy negates any capability to preserve experience objectively. The sensation of our experience, however, is subjectively defined by our own prior knowledge, capabilities, and memories. Each interaction with any object is therefore mediated by subjective individuality. For rocks, we can only interact with them on the most basic sensuous level. Through touch we feel their surface. In this touch, if they are hot or cold, we feel their surroundings. Rocks reveal their outer shell to our sight, sometimes also their interior. We only experience them superficially so they never linger in our memory as individual things. We associate them with a place, or a person, but never merely with themselves. 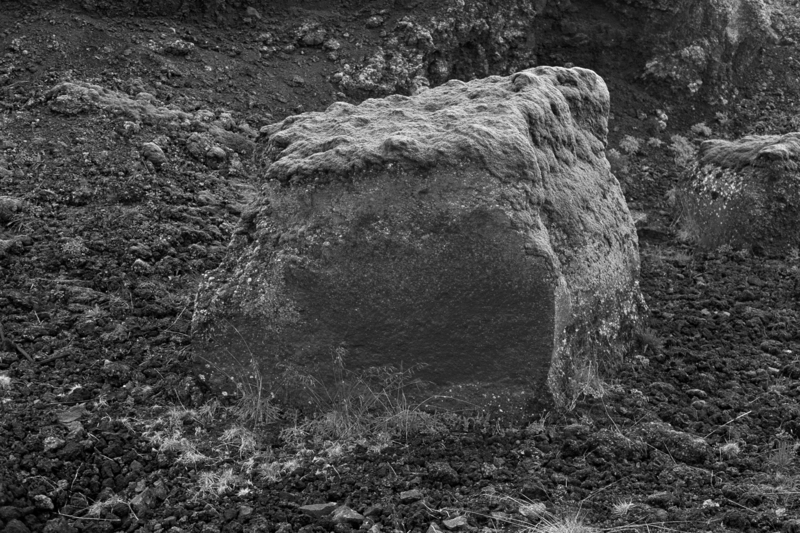 The scattered rocks in the photographs in this volume are tied to a story, they are silent embodiments of a narrative. This narrative relates to them while stimulating an independent story that focusses on the rocks. A story of withdrawal and restraint, where rocks provide surfaces for inconstant temporalities, at times expanding, at times contracting – an archeology of feelings. Mercurial rocks, bastardised as disembodied voices of memory. We hear of two persons and their fading love. We learn of their mutual memory, which is bound to dissolve, like so many things of the past. The two are dispensed in an mineral abeyance, the basis of their memories as steady and unchanging as the rock’s core, while details and nuances gradually fade away. The rocks here are a token of pictorial memory. Their presence in the photograph reminds us of their role as synecdoches of the story. The rocks reiterate a past experience. By means of this, they enter a paradox – their physical presence is in the now while their significance as allusive objects positions them in the past. Their bearing of memory renders these scattered rocks as ambivalent entities. Their stoniness becomes part of memory itself, a projection space for past occurrences. Roland Barthes alerted us that a photographic picture is always memory, a ghostly apparition of things that are physically lost. For rocks, physical loss is hard to achieve. Their resistant bodies defy the deterioration that befalls us every day. Thus, the memory of a rock functions in other ways. It is an object that experiences time slower, almost imperceptibly, that exists in a continuous present, lacking a clear past and future. In this way, it resembles an unfading photograph. 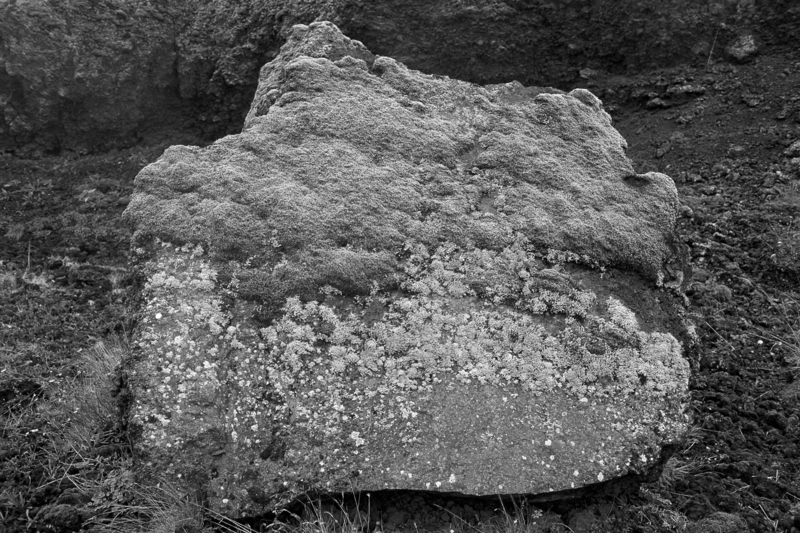 Just like the rock surface seeks to defy the elements and erosion, those chemical substances atop of the photographic paper strive to counter age and decay. 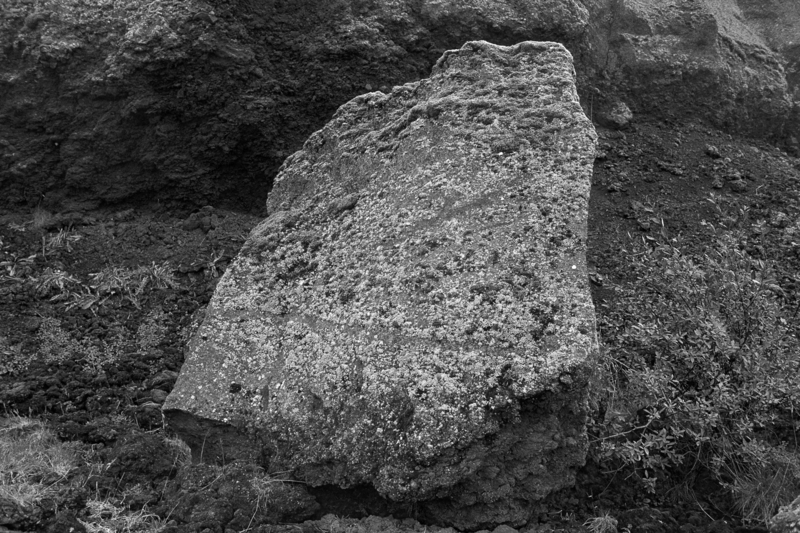 Hiroshi Sugimoto speaks of a rock as a time recording device, similar in nature to a camera. 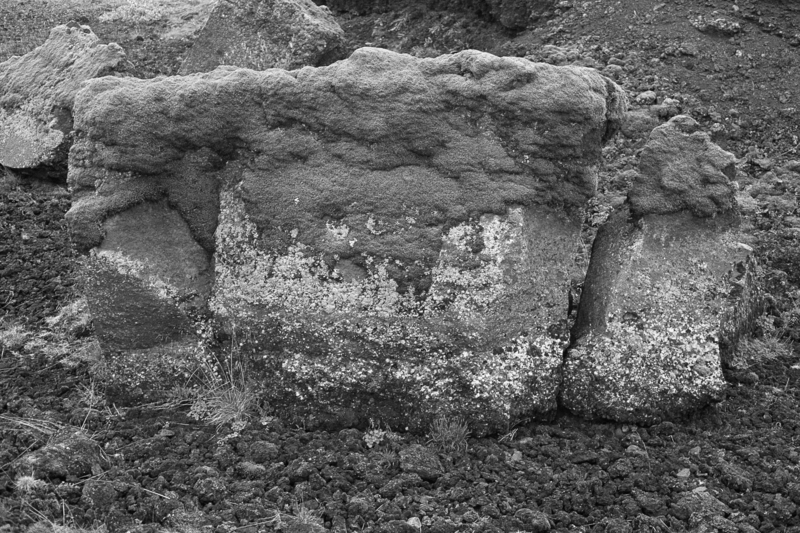 A photograph, he says, is an archaeological enterprise, both an inquiry into the past and a means for transporting the past into the present. This intriguing concept of the photographer as an archaeologist is doubled in the present photographs. A camera is a device for close scrutiny, for inquiry into the presence of a thing – a scientific apparatus. 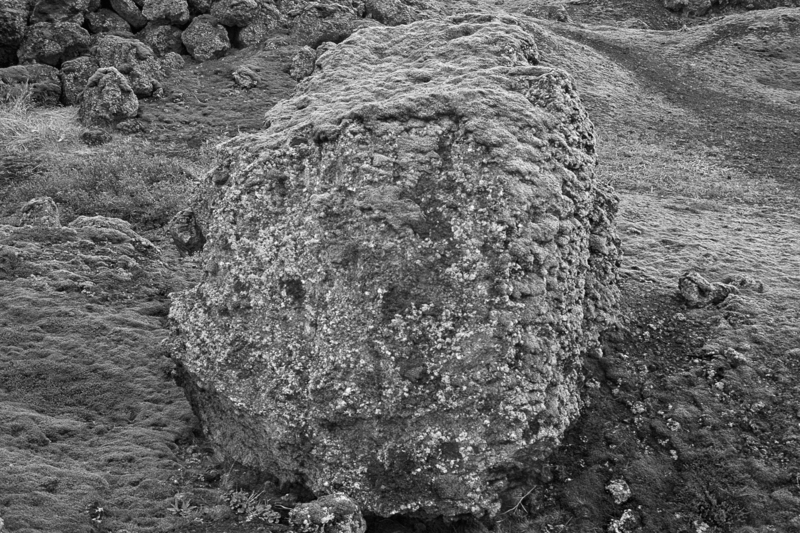 Just as an archaeologist examines every inch of a rock, seeking to explore traces of the past embedded in its stony structure, the camera explores its past and present. The rock, however, enables touch, a superficial yet powerful sensuous experience that helps the subject relate to the object. A photograph equally invites contemplation but lacks this haptic stimuli. The photograph feels remote as a physical object, although we may relate to its content. This certain remoteness of a photograph, on the other hand, nurtures its scientific aspects as a device for discovery. The camera’s lens becomes an explorer that ventures into the depths of time on a quest for memory. 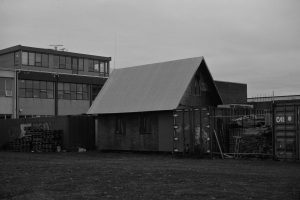 An inert feature of both, the photographer and the archaeologist create a distance to their object. This is a necessary trope in order to achieve the close scrutiny that their profession requires. Only then may they visualise glimpses of its thingness. Reflection on the object requires distance. Proximity – psychological and physical – reduces one’s skill of reflection. While the archaeologist excavates things of a bygone age, time capsules in themselves, the photographer encapsulates and preserves the immediate present. Both seek to make sense of time. The archaeologist achieves this by looking backward, the photographer, however, is highly aware of the present and anticipates the future. As a result, the photographer naturally faces a dilemma that Barthes has made us aware of. The instant he encapsulates in his photograph creates a present only in the very moment the photographer hits the shutter. Following that instant, this micro-present immediately turns into a thing of the past, an archaeological artifact. Thus, we can say a photograph’s existence is a continuous preterite. At the same time, this inert existence in a realm of the past paradoxically blurs boundaries of time within a photograph. As a tool of memory, it may render the past as the present – in deceit of the vulnerable viewer. The viewer’s desire for an aid to memory enables the photograph to alter the past. The selectivity of this single moment that, in the photograph, nurtures new memories which viewers may falsely recognise as true memories. Remembrance of the past is ambiguous in a photograph as it presents us with an alternate reality that we are readily inclined to accept. Photographs share this feature with the rocks. The evolution of these mineral things progresses so incredibly slowly that our limited mind perceives them as eternally unchanging, just like the moment captured in a photograph. A rock deceives our perception of time. While we see its stoniness as a never-ending, uniform thing, the rock’s continuous being is not eternal. 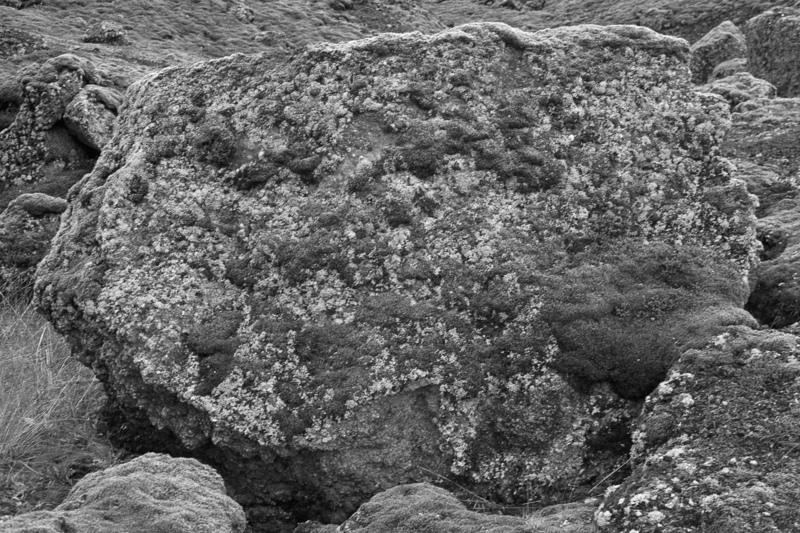 Slow and steady erosion cause the rock to alter its shape, just as the physical features of a photograph change over time. The mineral consistency of a rock determines the speed of this, sometimes enhancing, sometimes slowing the process. The chemical features decide the preservation state of a photographic picture. With the fading of the image, its memory fades. As the tool for remembrance changes its features, our awareness of time increases. We observe the same phenomenon when contemplating the withered surface of a rock in the state of continuous erosion. Taking it in our hands, we feel its skin that is broken with the cavities of time, the traces of this fascinatingly different kind of existence.